I have several build options for a RepStrap at this point. The second option is to follow Forrest Higgs' route and build a traditional CNC machine. I could theoretically build one for cheap. However, Forrest has yet to extrude much with it. At a later date I may have given this a try. All other options are centered on the Darwin design. I like the Darwin because it is... pretty. It may sound shallow but pretty can very easily translate to good mechanical engineering in my opinion. Also, it is a proven design. 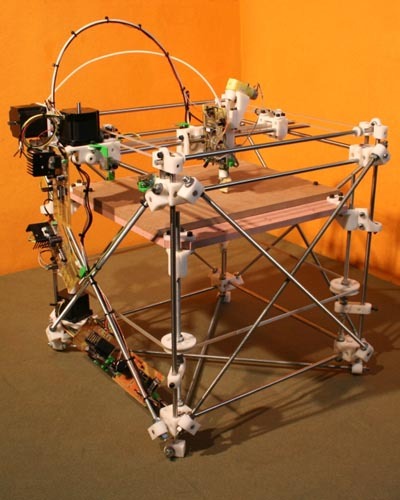 And... it has the potential to become a RepRap once you start printing parts to replace the parts you purchase or make. OK, so I've settled on the Darwin design. Now all that is left is to decide whether to purchase or build the replicated parts. If you refer to the image from the previous post the white and green parts are what I am talking about here. As far as purchasing these parts it looks like the only viable option today is to have them made at Ponoko. I am not willing to spend +$400 dollars on parts that I plan on replacing as soon as I can print them. It looks like I am stuck with making these parts by hand. But how?